Whichever direction you go in Austin, Cedar Park, Pflugerville or Round Rock, you will notice brand new luxury apartments opening up or being built to accommodate Austin's growing population. At Apartments Express, we can help you maximize your search for brand new luxury apartments in Austin TX in a fast and efficient way. Whether you look to move to downtown, central, north central, northwest or northeast area of Austin, Cedar Park, Round Rock or Pflugerville, our extensive knowledge of the Austin apartment rental market can alleviate stress and simplify your apartment search process. How do you like getting everything done within a day or even 3 hours? We keep an up-to-date listings of all the brand new or recently opened high-end, luxury apartments in Austin and the surrounding areas so you do not have to surf the internet looking for who is offering THAT floor plan, THOSE amenities, THOSE features and/ or move-in date you desire. We'll do that tedious work for you. Unlike any other part of the country, our apartment locating service is completely free to you - no hidden fee, no additional cost to using us as your apartment locator. Should you have any questions regarding our apartment locating service, don't hesitate to contact us. We gladly answer any questions you have so you can let us assist you with confidence. 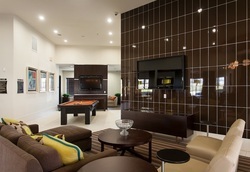 Following are examples of some of the nicest luxury apartment listings currently on the market in Austin Texas. View pictures, get an idea and call us to schedule for a personal, customized luxury apartment search. Quick access to 183 N (Research blvd. ), 360 N (Capital Texas HWY), MoPac (Loop 1), 2222 fm, Jollyville Rd. In order for us to better assist you, please include requirements such as number of bedrooms/ bathrooms, price range, move-in date, and areas.